Description: The Robert Morton Organ Company was a producer of theater pipe organs and church organs, located in Van Nuys, California. 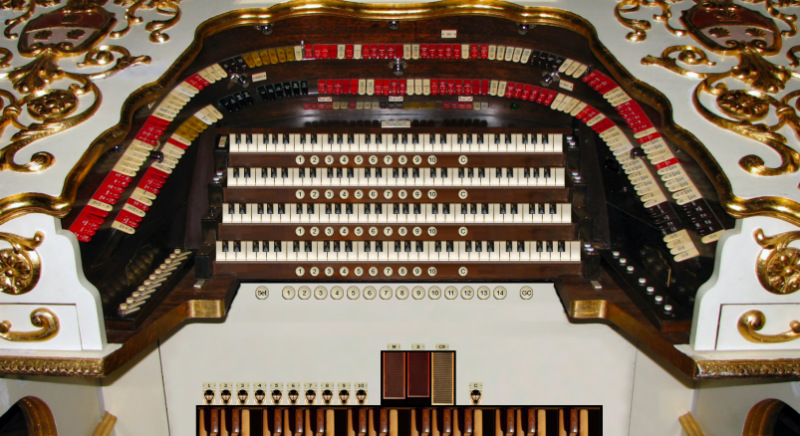 Robert Morton was the number two volume producer of theatre organs, building approximately half as many organs as the industry leader Wurlitzer. The name Robert Morton was derived not from any person in the company, but rather from the name of company president Harold J. Werner's son, Robert Morton Werner (thanks Wikipedia for this information!). The Robert Morton company had its origins in the Murray Harris Organ Company of Los Angeles. The company passed through various owners, business names and locations between Murray Harris and Robert Morton, including the Los Angeles Art Organ Company, the Johnston Organ Company, and the California Organ Company. Despite all the corporate change and upheaval, the output in terms of high quality and tonal character was remarkably consistent. Several Robert Morton key personnel were veteran organ builders who had served as apprentices with major English organ building firms. Tonally, Robert Morton organs had a reputation for being powerful, while at the same time refined and "symphonic" in character. Five Wonder Morton consoles were built for the "Wonder Theaters". These theaters were the top of the line in terms of looks and functionality, and hosted a 4 manual 23 rank Robert Morton Theatre organ. In producing this sample set we have kept this specification as our base, and so hope to present an authentic re-creation of the sound of these wonders.